One of the most talked about intiatives in Copenhagen is now underway. Nørrebrogade is a main street running through a densely populated neighbourhood and it has had problems thriving for many years. Many of the side streets are lovely, cosy shopping streets but the main drag is dreary. 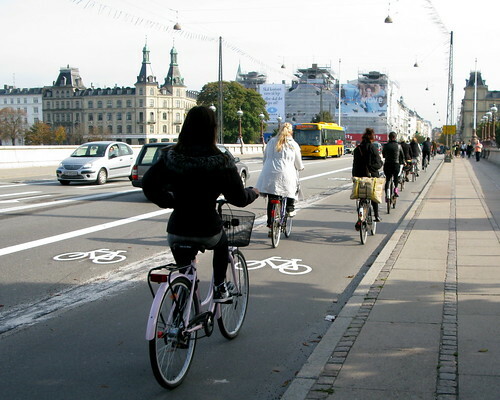 It is the busiest bike stretch in the nation, with 30,000 cyclists each day. 10,000 cars a day make their way down the street towards the city centre, despite the fact that only about 35% of the locals own cars. Vice-Mayor Klaus Bondam secured a majority at City Hall for a radical project. Closing off the street to cars. It was meant to be a permanent project but he had to compromise and make it a 'test' for a period of three months. Here's a previous post about, after it was announced. This is also the stretch that features the Green Wave - cycle 20 km/h and hit green lights all the way. Anyway, the work has begun. I got a text message the other day from a friend who uses the route. He said that overnight the bike lanes were doubled in width, with the new half occupying a former car lane, as seen above. He was thrilled. Often in the morning rush hour you'll wait for a red light to change with hundreds of other cyclists. This widened bike lane will improve the flow of bike traffic towards the city centre. The city has chosen funky street markings to alert everyone to the new system. 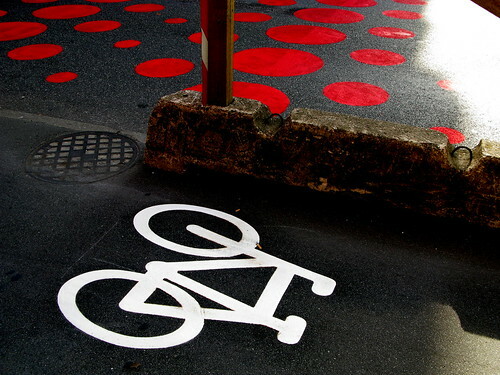 The red dots pictured are funky and functional, letting people know that this is a bus stop zone. At the moment cars still drive down the street, until everything is set up, and I stood there watching the traffic. Cars slowed and let busses go first - always a bit of a rarity. It was petrol poetry in motion. Other markings are on the way and I'll post them as I see them show up. There are signs on the streets telling people about the new system. There will be the red dots, which denotes Busses. 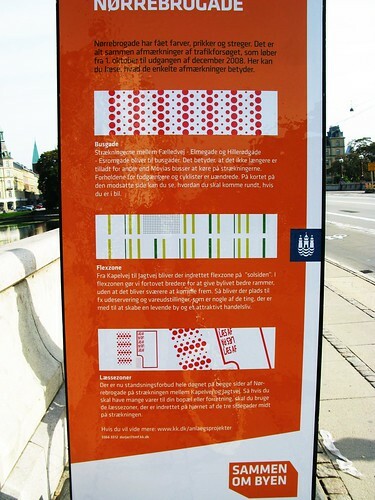 Then there are cool stripes that denote a FlexZone - where car lanes are reconquered in order to create space for cafés or restaurants to place outdoor tables or for shops to place displays of the goods they sell. All in order to create a dynamic shopping area and a liveable space for everyone. Lastly there are Loading Zones on side streets for goods that are to be delivered to shops or homes. 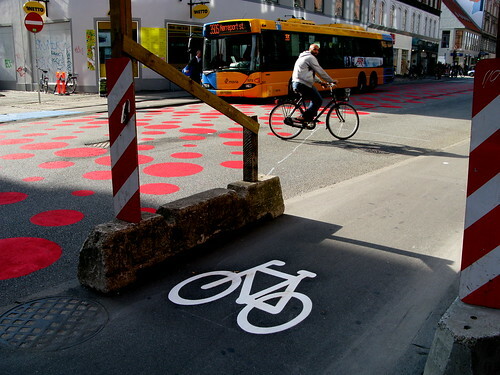 They feature the word Laes af/Laes paa - Load off/Load on, painted on the asphalt. It's all very exciting. I'll post more as it happens.